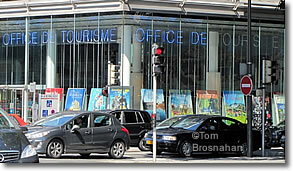 The Office de Tourisme in Tours, France, is across the broad garden plaza called the place du Maréchal Leclerc from the main train station (Gare SNCF de Tours) and across the street from the convention center (Centre International de Congrès de Tours). The eurolines bus ticket office is only a few doors away. Office de Tourisme de Tours.